Upstate Medical University associate professor Juntao Luo, PhD, has been awarded a four-year $1.5 million National Institutes of Health R01 research grant to continue studying a novel technique of removing toxins and other dangerous molecules from the blood to prevent and treat dangerous sepsis. The title of Luo’s project is “An innovative hemoperfusion nanotrap for sepsis treatment.” His lab is developing a “highly efficient nanotrap for hemoperfusion therapy to remove the range of triggers and mediators of sepsis.” Sepsis occurs when the body’s response to an infection triggers a dangerous systemic inflammation, which can lead to organ failure, and in severe cases death. Removing those triggers and mediators from the blood can lower the risk of developing sepsis. The World Health Organization estimates that sepsis affects more than 30 million people a year around the world, and kills more than 250,000 people in the United States annually. Luo, who has worked at Upstate for seven years, has been working on this project for about two years. The NIH grant will propel his research one step closer to a clinical translation, he said. Luo is collaborating with Upstate professors Guirong Wang, PhD, and Gary F. Nieman, MS, on this project. He is hoping to collaborate with additional Upstate departments to initiate clinical trials in the future. Luo’s research areas also include nanomedicine, drug delivery, cancer imaging and cancer treatment, among others. This is his fourth NIH grant. 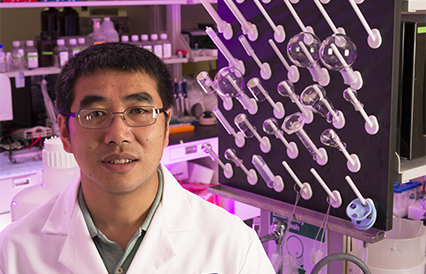 Caption: Juntao Luo, PhD, will use the $1.5 million NIH grant to study a novel technique of removing toxins and other dangerous molecules from the blood to prevent and treat dangerous sepsis.